E. Direct Students to follow the directions below. F. Remind students to work responsibly and to raise their hands for your assistance as you walk around to help students. G. Ask students to close out of Internet Explorer (click on the X on top Right of Screen), log off (Press CTR, ALT, Delete and select Log Off), and turn Monitor off approx. 3 minutes before the end of the period. F. Students are to push in chairs, and line up according to your instructions to wait to be picked up by their teacher. 4. Type your Password and press ENTER. 8. 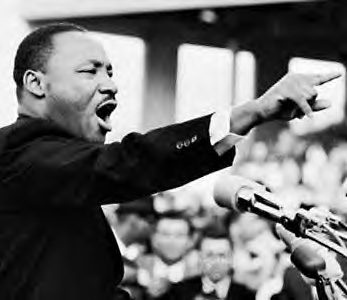 Students to view the video about Dr. Martin Luther King, Jr. and the Civil Rights Movement. 9. Students to click on the image below to link to the Microsoft WORD document needed for this lesson. 10. Students to describe their Dream for Making the World a Better Place. Students are to reflect on the ways that they dream the world could be a better place. Students are to type COMPLETE SENTENCES inside the speech bubble on the WORD template describing one or more dreams they have to make the world a better place. 11. Students increase the font size to make their sentences easier to read. 12. Students can change the font style to personalize their work. 13 Students add their name. 14. Students save and or print their finished "I Have a Dream" sheet. Make sure to include your name when you save and print to the B/W printer (not the color printer). 15. Students to turn in their work. This lesson plan integrates technology into Social Studies.